After Nepal disaster today Japan also shocked on a massive earthquake of 7.8 rec.scale. As per the latest report, there is no damage and no alert of Tsunami, because of the origin of the shake is too deep in the ocean. Pacific Tsunami warning centre officially announced, no need of any worries it will not make any changes in coastal area. Residential buildings in Tokyo swayed for around a minute as the quake built in intensity around 8.30pm (9:30 AEST). The epicentre was 676 kilometres below the Earth's surface and was centred on a remote spot in the Pacific Ocean around 870 kilometres south of Tokyo, the USGS said. Yoshiyuki Sasamoto, who runs a traditional guest house on Chichijima, one of the closest inhabited places to the epicentre, told NHK the shaking had been violent. "Initially a weaker quake hit and it stopped. Then the big one came. It was so strong that I couldn't stand still and couldn't walk," he said. Both runways at Narita Airport, the main international gateway to Tokyo, were temporarily closed while inspections were carried out. Trains in Tokyo were also temporarily halted and a football match in the city was briefly suspended. Tokyo Electric Power Company (TEPCO) said there were no abnormalities at the crippled Fukushima nuclear power plant following the quake. 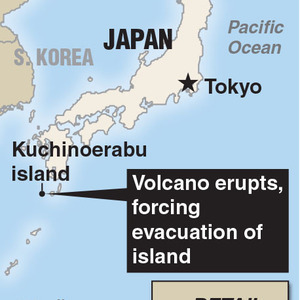 A massive undersea quake that hit in March 2011 sent a tsunami barrelling into Japan's north-east coast. As well as killing thousands of people and destroying communities, the waves also swamped the cooling systems at Fukushima, sending three reactors into meltdown. Saturday's quake was the second sizable shake Tokyo has had this week, after a much less powerful, but far shallower quake hit close to the capital on Monday. On Friday, a volcano in the far south of Japan erupted, spewing a huge column of ash high into the sky and forcing authorities to evacuate the island on which it sits. The eruption caused no injuries and no damage was reported, but it served as yet another reminder of the volatile geology of the country.